Price is shown for 3 kg (6 pound - minimum weight for this cake) vanilla cake with Mina Cartoon design from Coopers. This cake is also available in bigger size and chocolate Flavour. Please select the required weight and preferred flavor, then Add this product to the Shopping Basket. Delivery to Dhaka is free and shipping charge applies for other cities as it has to be transported from Dhaka via air-conditioned service. This product is not available for same day delivery and it needs to be ordered by Dhaka time 3 PM on the day before delivery date. 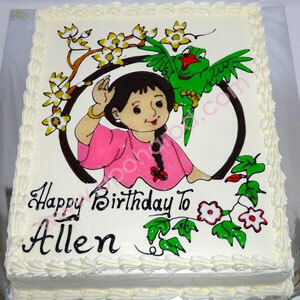 Order Cake from Mr. Baker or Kings for urgent orders. This package is suitable for about 3-5 people and please increase the quantity to cover more people. Package is available to Dhaka metro only. MAKE A CLASSIC NUMBER YOUR NEW ONE! by purchasing a banglalink classic number from your nearest banglalink store for only tk. 200, you too can be special! The UNLIMITED FnF is a new Robi prepaid package that offers the subscribers the ultimate chance of selecting as many FnF numbers as possible, that too, with the most attractive rate and lifetime validity! 1. Any Robi prepaid customers (except Uddokta, Easyload/PCO, SME, and Corporate) can migrate to this prepaid package by dialing *8999*90#. - Subscribers can migrate out to any other packages using the respective migration codes. - A maximum of 80 FnF numbers can be configured. - Charges of any other services will remain as per the standard rate. Subscribers of the UNLIMITED FnF package will now be able to enjoy an UNLIMITED SMS pack for only Tk. 5! - The UNLIMITED SMS pack is applicable for the subscribers of the UNLIMITED FnF package only. Any Robi prepaid customers (except Uddokta, Easyload/PCO, SME, and Corporate) can migrate to the UNLIMITED FnF package by dialing *8999*90#. - There is a cap of a maximum of 60 Robi-Robi SMS and 40 Robi-Others SMS. - SMS can be used for local numbers only. - After the consumption of this UNLIMITED SMS pack, P2P standard tariff will be charged. - To check the balance of Robi-Robi SMS, customers need to dial *222*10#. - To check the balance of Robi-Others SMS, customers need to dial *222*20#. - Subscribers can purchase this pack as many times as they want. - 3% Supplementary Duty (SD) + 15 % VAT on price inclusive of SD applicable. • After purchasing Huawei Honor 4X & Honor Holly smartphone, Subscriber has to a made a successful voice call from his Robi No tagging with Huawei Honor 4X & Honor Hollysmartphone to any valid MSISDN No to register for the bundle eligibility verification. • Bonus will be disbursed within 72 hrs from tagging. • To enjoy the bundle subscriber has to tag with both the mentioned Samsung Huawei Honor 4X & Honor Holly smartphone & the registered mobile no. • To enjoy the bundle subscriber has to tag with both the Huawei Honor 4X & Honor Holly smartphone & the registered mobile no. • Bundle minutes will be applicable only for local calls. • 10sec pulse applicable for bundle minutes. • For Post-paid, Package wise pulse is applicable. • After consumption of Free bundle minutes, package wise regular tariff will be applicable and 1p/10kb will be charged after the consumption of the purchased/bundle DATA amount (PPU) within validity.